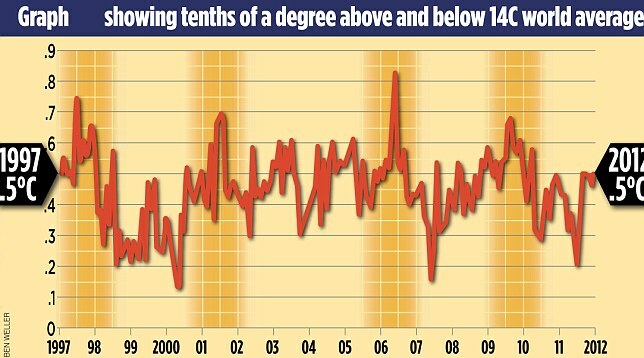 The Met office responds to 'Global warming stopped 16 years ago' | Watts Up With That? This article and graphic from David Rose in the UK Daily Mail has caused quite a stir as we covered it here over the weekend. The Met Office has responded exactly as one would expect they would and I repeat their response below. One wonders what the Met Office would say about the data if the many circular adjustments and artificial biases were removed from the data. ← Monday Mirthiness: Severely unsettled science? Check the comments and especially the MO’s replies. They agree with Rose, but are pretending not to. They sure do like that chart – “eight of the warmest years on record have occurred in the past decade”. Yes, but only after the 1930s were airbrushed out. To keep Phil Jones happy until retirement, we need a good volcanic eruption so it can be blamed for the absence of warming. For a few years anyway. And many of the highest points on a sine-wave, will be near the crest of the wave. That does not imply that the sine-wave is not in decline from thereon in. Did these guys ever get beyond kindergarten? I aways suspected the warming was driven by UHI and that would peak at some point, seems it peaked about 16 years ago. The weasel words: “on record”. If you use a longer period from HadCRUT4 the trend looks very different. 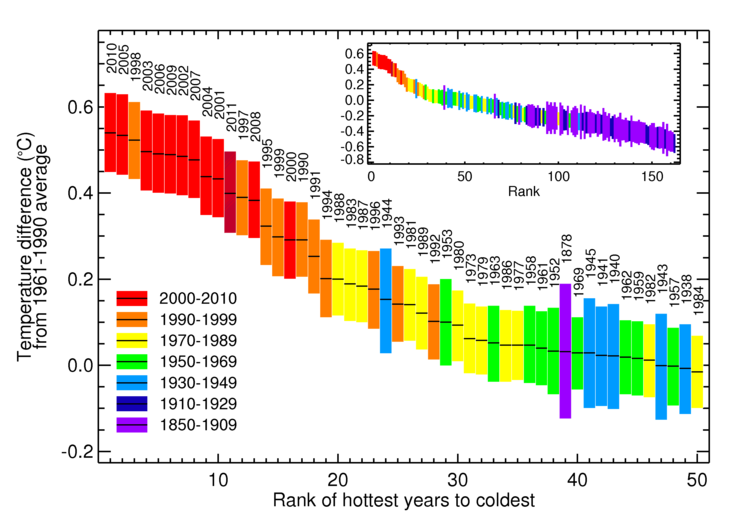 For example, 1979 to 2011 shows 0.16°C/decade (or 0.15°C/decade in the NCDC dataset, 0.16°C/decade in GISS). Why choose 1979, as we all know this was at the end of a cold period? so they fully accept what everyone knows? are they thinking 30 years or 130 years? funny though, I don’t recall that argument when they were harping on about CAGW in the early 2000’s!!! And if the Met disagree with cherry picking, why do they show a CET graph prominently on their website, which begins at the very cold interlude around 1780, instead of showing the full period that the CET series covers, starting in 1659? absolutely! but of course if they use the proper records and the WHOLE data as reference line – it wouldn’t show what they want! I think the linear trend argument is weak. Suppose I want to argue that global warming stopped in 1998, and I cheat. I change the temperatures for 1999 and 2000 to support my case. So I make them both colder before having someone graph the trends for me. It turns out making 1999 and 2000 colder makes my argument weaker as suddenly the trend has gone up! To support my case, I should make 1999 and 2000 warmer than 1998 to argue that global warming stopped in 1998! Of course. All of them did. They aren’t ignorant. Combined, several of these factors could account for some or all of the reduced warming trend seen over the last decade – but this is an area of ongoing research. A tacit admission that they don’t have enough information to attribute ANY change in temperature to any specific factor. You show 2011 in brown, but it’s not in the legend. That has 2000-2010, which is the only range with an end year that’s not a 9 and implies the past decade was 11 years long. When you update things for 2012, I suggest making 2010-2019 be brown and clarify whether the “past decade” is the last 10 years, 2000-2009, or 2001-2010. Where did they get the equipment capable of measuring to an accuracy of 5/100ths of a degree? Weasel words, that’s a great term. I’m going to use that if you don’t mind. I think how often have I seen weasel words used by researchers, reporters and politicians but could never think of an accurate way to describe them. Weasel words, I like that very much. We have limited observations on multi-decadal oceanic cycles but we have known for some time that they may act to slow down or accelerate the observed warming trend. Then why aren’t they in your models? And why are you continuing to stump for predictions made with models that you have known “for some time” are missing a component that can both cool and warm at a magnitude larger than the CO2 effect you allege? In addition, we also know that changes in the surface temperature occur not just due to internal variability, but are also influenced by “external forcings”, such as changes in solar activity, volcanic eruptions or aerosol emissions. Combined, several of these factors could account for some or all of the reduced warming trend seen over the last decade – but this is an area of ongoing research. Of course it is. Not an area of ongoing research: figuring out how, combined, several of these factors could account for some or all of the warming seen over the decade prior to the last decade. Later on in the article I show my own CET rconstruction of CET to 1538 based on observational records, many from the Met office library. I wonder if you have an opinion as to whether the small UHI adjustment of 0.2C used by the Met office (and quoed in the article) really represents the reality of heat island modern Britain? No, they did not get beyond kindergarten, except in media manipulation. The graph that they present might impress some folks who are impressed by bright colors but, just as you point out, absolutely nothing can be inferred from that graph. Surely, they know this. Pathetic. First they admit that multi-decadal oceanic cycles “may act to slow down or accelerate” the warming trend. But then they go on to say that it and other factors could only account for some of the “reduced warming trend” over the last decade. They can’t bring themselves to admit the obvious — that these factors could also account for the increased warming trend observed from 1980-1996. If oceanic cycles are not yet well understood, why couldn’t they account for some of the warming? Response does not make a very good argument regarding the anthropomorphic causes of any warming actually occuring over the longer periods of time and, in fact, admits that in the short term “owing to climate variations such as ENSO” temperatures are enhanced or mitigated. So, why not over the longer term as well? Why would only CO2 be a long term causal variable? Reduced warming – It is like the Fonz trying to say SsoSoSooSorrSorry. I do NOT doubt, that Temperature sensors that can record Temperature changes much smaller than 0.05 deg C do exist. That is they can accurately record Temperature changes OF THAT THERMOMETER to that kind of precision. I note that the MET office cited NO ERROR BOUNDS for that 0.05 deg C change only that it was for that 15 year total period they cited, which presumably is the data graphed in the first figure. So WHY does the MET office place ANY significance on that 0.05 deg C change, if they are unwilling, or reluctant, or simply lackadaisical to the point, that they omitted the error bounds on that 0.05 deg C.
But it’s the lack of connection between their limited data set, and any planetary causal phenomenon that gets me. Meanwhile presumably the atmospheric CO2; that all powerful forcing agent, presumably kept up its inexorable maybe 1.5 deg C per year rise during that time fraim so maybe 20-25 ppm of CO2 with nary a trace of Temperature effect. Last night on PBS T&V, I watched Bill Moyes carry on a somewhat dumbfounded “interview” with some unknown un-named “photographer” who is pushing hs book/DVD/whatever all about ice, and the geologic record in that ice that proves to him (the “photographer” that we have already passed the tipping point, and are now in unrecoverable territory. Well he is still in favor of spending billions of the Western world’s productivity to recover from this unrecoverable disaster; so long as they have enough left over to buy his book/DVD/whatever. No he presented absolutely NO physics/chemistry /etc in support of his “sky-is-falling” hysteria. Bill Moyes looked his usual goggle eyed bewilderment, and simply lapped up what this otherwise charming looking chap was feeding him. Yes; Big Bird, is not the only one on the public dole who needs a well deserved retirement. So, NCDC says maybe people moved the thermometers from city centers to cooler outside the city airports. So, NCDC adjust the temperature back by adding in increments for the removal of the thermometers from the heat island effect adding in the artifical heat of the city which they seem to want to keep including even going to the extent of adding it back in when people try to move thermometers to less biased locations. Okay. But why are they adding back in the heat island effect? Is there a different way to read their statement? Why make these adjustments anyway? Can’t we assume that over a large enough sample of thermometers located by people they are not systematically choosing cool locations or warm locations but choosing better locations over time or at least equally bad locations. The large magnitude of the “adjustments” subtracting and adding 0.5C to the historical record implies almost a systematic attempt by thermometer placers to “reduce” the temperature today and an opposite motive in the past people systematically attempted to raise the temperature by placing thermometers in heated places but somewhere around 1980 thermometer placers systematically changed motives to reducing temp readings from their previous bias to place instruments trying to raise temperatures. Without justifying such counterintuitive behavior don’t we have to assume that over time thermometers in the US are sufficiently distributed and being placed over time with either the same or better overall placement? How can one justify a 0.5C adjustment to the overall record becasue of a bias in placement that hasn’t been demonstrated but simply through mathematical trickery to the underlying data? What! Bring out the 97%. Now where did I hear about the 95%+ or 97%+ or whatever ‘certainty’ that it was man’s greenhouse gases what done it? Climate change can only be detected from multi-decadal timescales due to the inherent variability in the climate system. Remember this quote chaps. It’s the one to use whenever they attribute weather events to climate change. The funny thing is that despite this quote they keep ignoring it. They know full well the IPCC and the WMO use 30 years or more of weather data to define climate. In other words, trends don’t matter because of natural variablity. Except when we tell you its CO2!!! Time to spank these children and send them to bed. This is OT – on what appears to be another new form of censorship. As some may know, WOT is a very popular Firefox add-on whose main original purpose was to warn users about potentially unsafe sites (unsafe in the technical sense: trojan horses etc.). It works by people giving it a safe or unsafe rating. If a site has a bad reputation, it gives you a red circle next to a google search result. If you try to go to it directly from a link, you get a big warning page about its potential unsafety. Most people will be deterred from going to it, unless they personally know it’s safe. I am not very familiar with the first two, but I often visit CO2 Science, a very informative site, and was surprised to see it had acquired the reputation of being unsafe through WOT voting. All kinds of sites are being thus labeled just because voters disagree with the ideas they find in them, nothing to do with their safety. Example: the Save America Foundation is a perfectly safe site. It happens to be concerned with the lack of transparency inherent in electronic voting machines, the potential for fraud, and various other constitutional issues. Today I wanted to go to it in order to read an older article by Victoria Collier (who has just published a new report on the topic in the November issue of Harper’s Magazine). Again, you get the spooky-looking WOT page warning you that you may be going into unsafe territory. I am considering turning WOT off permanently. Such zealotry everywhere!! Looking at successive decades over this period, each decade was warmer than the previous – so the 1990s were warmer than the 1980s, and the 2000s were warmer than both. Eight of the top ten warmest years have occurred in the last decade. That’s what I call critical mass public consumption of truth. Actually, August 2012 was near the end of a weak El Nino. And why would we think that the 1997 value did not use January data? The title of the graph does not mention only Augusts. Even ignoring all that, the linear trend was supposed to be 0.2 C per decade. His using the lower 0.05 numbers is rather indicative that the realized warming over that period is much lower than the IPCC’s best estimate. obviously Michael Mann hasn’t been observing the data! “If you look at the US, some of these things are unfolding ahead of schedule and we are already contending with climate change impacts that were once theoretical,” he said. “We predicted decades ago that this might eventually happen. We are watching them unfold and there are very real consequences to our economy and to our environment. The silver lining in all the bad news is that while the political system is gridlocked when it comes to confronting climate change, public attitudes are starting to change. “It is going to take a little while to sink in,” says Mann “but there is evidence of a dramatic shift in awareness and the public increasingly recognises climate change is real and if the public becomes convinced of this, they will demand action and they are connecting the dots because we are seeing climate change playing out in a very visible way. He said the tactics of those who question climate change was not only to intimidate scientists already in the public arena, but also to warn off others from taking part in the public discourse. But Mann believes the power of the Koch brothers and others in the fossil fuel lobby, whom he believes have been responsible for poisoning the whole climate change debate, is on the wane. I;ve seen various dates as to when Co2 started to cause some warming. 1950 is used by BEST. Others use 1970. In either case, the concept of 140 years of AGW is bogus and should not have been used. Rose’s headline “global warming stopped ” is imprecise and misleading”. It is true that SST data – the best measure of global temperature trends because of the thermal inertia of the oceans and the UHI effect on the land data – show that there has been no net warming since 1997 – with CO2 up 8,5% .However the same data show that warming peaked in about 2003 and that since then the earth has actually been in a cooling trend. 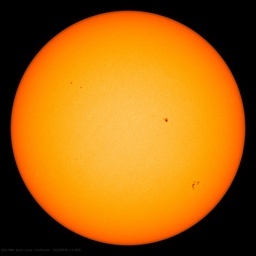 Empirically the phase of the PDO and the declining solar magnetic field strength ( Livinston and Penn) indicating a possible coming Maunder minimum , suggest at least 20 – 30 years of cooling. Beyoned that our knowledge is insufficient to make any actionable predictions. The IPCC climate models were and are structured to produce a desired result and have limited empirical connection to the real climate. Hands up who thinks there is much chance of temperature records from 100 or even 70 years ago being correct to two decimal places. Neither was the previous period of increased warming. With more, let’s say independent forecasters inclining to the view that temps are about to head downhill over the next decade or two, the entertainment might get better yet in the years to come. I have a suggestion for some real number crunching here; Remove all decimals. A straight line. In other words; Nothing to be alarmed over. Why do they get away with the above, often repeated, statement as evidence that warming is continuing? In that context it’s logically meaningless because it’s exactly what you’d expect if there had been warming 9from whatever source) which stopped in the last decade or so. Once something warms up, it takes time to cool down again even if you turn down the heat source. In fact, anything else would suggest worryingly rapid cooling ahead! > Actually, August 2012 was near the end of a weak El Nino. El Niño conditions didn’t last long enough to cause things to be declared an El Niño. I don’t have time to dig up the definition, but it’s sort of like a recession – by the time it’s declared, everyone knows it is. More to the point – I think El Niño warming takes a few month to make it into the temperature record, so we may not have seen it yet. Buy the biggest computer on the block and all the big iron goes to your head. Or is that the biggest computer in the country? 1) It is not uncommon in the simulations for these periods to last up to 15 years, but longer periods are unlikely. Says the Met Office. So if we do not get back to warming by 2015, what, then? Does “unlikely” become “within variation as predicted by computer modelling”? 2) external forcings”, such as changes in solar activity, volcanic eruptions or aerosol emissions. Combined, several of these factors could account for some or all of the reduced warming trend seen over the last decade – but this is an area of ongoing research. For a start: “reduced warming trend”, i.e. statistically zero. Then: CO2 forcing must equal at least the negative forcings of the other, cooling trends. But they are not sure. Still, you could rule some out: volcanic eruptions? Definite “no”. Aerosol emissions? Just got a negative forcing number to check. Solar … another hard number to check. They are getting backed into a corner, you think? Its important to understand that not only is temperature not responding but the energy is missing. Climate and weather are one thing but conservation of energy is an immutable law that must be satisfied instant by instant. The energy is missing. It’s not in the oceans it’s not in the atmosphere it’s not on the earth. It escaped. If it escaped and they didn’t predict it would escape then how dO we know it won’t all escape? If that energy has escaped why? How can any prediction be taken seriously if they didn’t understand this? Moreover, their claim is an absolute insult to anyone who understands a minimal level of Math, Science, or logic. It is an insult for the gang to think there are so many “stupid” people who can not see through the poor logic of their statement. Sure, some of the mathematically challenged folks may not see through the manipulation of the comment immediately, but once explained they understand. It is obvious that the agw fanatics think little of average person. They assume their scare tactics will work that if they say that te petabytes remain high that the average person then concludes they are right that temperatures could climb 3C by 2100 when there is zero change in nearly 2 decades. This may work for another few years but it’s unmistakable that the consequences of agw is inconsequential unless you are a pure h2o ice crystal located north of 80 degrees latitude. Who are you gonna believe? The Met Office…. or your lyin’ eyes? But CO2 levels have continued to rise in the last 16 years – so temperatures must have risen – this means that the adjustments to the raw data simply need to be re-corrected. (Contribution from the Lewandowsky-Jones school of cognitive logic and Excel tutoring, Western Australia & Eastern Anglia, ‘green consultancy work and payola are our specialty’). in case barry woods is about the place! So the Author Team at Skeptical Science would like to offer Phil Jones all the moral and emotional support we can (and all his colleagues who may have experienced similar abuse). To this end we will shortly be sending Phil a letter of support from all of us here at SkS. The Met Office’s reply has been met with a stinging reply. No more adjustments available, too many people watching..
Urban areas have swallowed most of the land thermometers that can be swallowed. They have got rid of most of the rural ones and remote one. where did they all go ?? Of course the calculated urban land temp has leveled off. Now watch it start dropping over the next few years, and not even GISS or HADCRUD will be able to stop it. So from the grandiose “coalition of the unwilling”, the more-than-20 countries who seemingly signed up in Moscow and then New Delhi a couple of months ago to fight the EU aviation ETS, there are now 2 entirely predictable refuseniks: China and India. Today there are just 10 airlines from these 2 states representing less than 3% of total aviation emissions. So the bottom line is more than 1,200 airlines from all other countries except China and India have complied. I believe this is a significant and successful outcome by any standard. I look forward to sanctions being applied to Chinese and Indian airlines for any continued non-compliance: the respective EU member state regulators will have our support 100% if and when penalties become necessary. Has anyone noticed that each and every article about the ETS by ATW, Jeffrey is always the first to comment? I think he is getting a kickback from ATW to start the debate by expressing a very arrogant and self righteous position. It would appear he is informed of the article before it is released. Anyone agree with this observation? This appears to be one of the ten most dishonest reports ever issued by the Met. And I would bet if we ranked their reports from most to least dishonest the top ten would fill the current decade. I followed the link to the hadcrut4 site. Itz worth it to take a look at the global anomaly map. I was very surprised at how much area actually has negative anomalies in comparison to the 1961 to 1990 reference period. Mostly in the oceans. On the other hand most of Africa and Siberia have no data at all and appear to be adjacent to (in part anyway) in low or negative anomaly areas. I think the first scalp has been taken. Intersting that they talk about the PDO and AMDO, whereas most other alarmists simply ignore them, such as the Australian Academy of Science in its reponse to Plimer’s latest book-How to get expelled from school. Makes interesting reading as the current state of the consensus. Note uncertainty in the “sign” means they think the earth may even be cooling- but they still shy away from using the c word. In this SREX report they recognised that they could no longer scaremonger on the basis of the trend and so in that report and in the forthcoming AR5 they have chosen to concentrate on “extreme” events to promote their scaremongering anti CO2 policy propaganda.The core alarmists Hansen, Mann Trenberth McKibben and Romm and their female acolytes and the ecoleft media propagandists are simply following the IPCC script with their ever more hysterical predictions of future extreme disasters even as the real earth obstinately refuses to warm up. Or you could apply an ounce of common sense. If you are interested in the warming/cooling trend plot the rate of change, not the damned temperature or anomaly! If you think that climate change is defined by some particular period, plot a moving average on that basis. Now you have a signal of your chosen resolution and can see what is actually happening. No linear trends, no silly arguments about start and stop points to hide behind. Pretty much the same thing, yes? But now we can see up to 2009 and that net cooling appears to have kicked in somewhere around 2007. Please explain why anyone should contribute one penny in taxes to fund the sheer stupidity of trying to discriminate a 15 year or longer signal from this level of noise that is an order of magnitude smaller than your ability to take a temperature reading, let alone fudge up some putative global average temperature to three decimal places. Someone somewhere really needs to get a grip on the purse strings. Like Vladimir and Estragon in Waiting for Godot they’re now stuck waiting vainly for the warming to return. They’re sure it’s coming, if not today then tomorrow, if not this year then the next. The last word here should be normal. The original purpose had nothing to do with the issue of climate change as that phrase is currently used. “Normal” was a number used to give folks a reference with which to compare the day’s weather in their local area. “Climate” was understood to be a complex pattern of seasonal variables as described in the Köppen-Geiger system that early on included vegetation boundaries (involving costly and time intensive field work). Note in the map at the following link, the period was from 1951 – 2000. Definitions are on page 21. Jim provides a link to one of the most error-filled essays anyone can find. Please Jim, when linking to this sort of bs, give us a hint as there are better things to spend time reading. Personally I was wondering what happened to 1940 – records from the Battle of Britain indicate that it was an unusually long and hot summer and it was this that the Germans took advantage of to extend the battle as long as they did. According to the “new think” 1940 was not unusual at all – perhaps the whole thing is a figment of my imagination, perhaps there was no Battle of Britain, perhaps there was no Dunkirk (also unusual weather) perhpas there was no D-Day (also unusual weather), perhaps the whole thing never happened. Now who’s denying! The MO may use 0.2’C officially as the value of UHI, but in the UK TV weather forecast the assumed value is 3-4’C. The phrase “but 3′ coder in rural areas” is used all the time together with “much colder in rural areas”. Perhaps TV weather girls- sorry persons have a better idea of UHI thate the MO? re-writing weather history, I beleive that the winters after 1940 were cold, 1944 (Battle of the Bulge) certainly was and I think 1941-42 and of course 1947 which wasn’t equalled in the UK until 1963. Does the word “warming” have the same meaning in GB? Where I come from warming means the temp is slowly rising. If the temp is staying the same we say it is “still warm” “maintaining temp” “leveled out” but never warming. To even make the statement that 8 out of 10 are the warmest is utterly misleading and bereft of basic intellectual honesty. The theory being discessued iis global warming, not global staying warm. Sorry, didn’t you know? Rock and Roll just got backdated. Elvis really has left the building. Noise? What noise? Sorry, can’t hear you. Can you speak up? No. Sorry call back later. If CO2 were the main forcer, the temp would track the CO2 level. And if for some reason the temp were to lag, like 1945-1770 or the current slump, the temp would race to regain the proper relation to the CO2 curve. Instead, the slumps seem to be cumulative. Conclusion? Something else is at work here, and whatever it is, there seems to be a 30-year cycle. Argument “but our models show there is possibility for lull in warming up to 10-15 years” is pure BS: where it is? In the CMIP3 model ensemble mean it is not. One has to look at the time scales to assess whether the climates temperature is increasing or decreasing. Climate is an average of the observed weather over a period of 30 years. Therefore one cannot make a statement that the climate has not increased or is leveling over a 15 year period. If this phenomenon persists for the next 15 years then one can say that the new climate regime will be of a higher average temperature than that experienced in the past, due to the fact that over the past two decades the observed temperatures have been higher than the norm. The reason why climate is assessed over a longer time period than 15 years is to account for the climate variations as well as the ocean-atmosphere coupling that have an effect on the weather experienced on a yearly basis. However, one cannot ignore that fact that the observed climate over the past couple of decades (30 years or longer) has not shown a stable climate variation around a “norm” and therefore the average climate for the current period cannot be estimated or stated to be “ leveling”. The problem with this analysis is that science is not that simple. If one is a particle physicist one can say that the probability of finding a particle is one in a million type interactions. Scientists then do millions and if they see a normal distribution around a million per instance they can say their predfiction has merit. Climate science has no repeatability. All the data in the past is suspect or error prone. No matter what reasonable time period chosen we can’t be certain that any prediction by itself says anything about how good our theory is. Also, it is awfully convenient for the theorizers to say that to “disprove” their theory we need 30 more years of data. That’s not the way REAL science works. Real science would say you haven’t proven anything until 30 years has passed, maybe 60 or 90 or 120 years so the experiment can be repeated and repeated. In a situation like this scientists need to find analogues to the 30 year problem. Fortunately there are some simple tests. The law of conservation of energy is an immutable law of physics. Every instant (not every 30 years) energy must be conserved. If the theory of AGW cannot ascribe where the heat went even if not into surface temperatures but can show how it shows the energy must go into oceans or under land or escape into space or go one place or another and we find that energy there then we know that at least the theory is internally consistent. Maybe temperatures on the surface aren’t going up. The AGW theory has to be able to explain where the heat went and we should be able to measure it. This will eliminate the problem with weather vs climate. If the theory accurately predicts the quantity and place that the heat can go and why then it is on much stronger ground. Unfortunately to my knowledge this is now the biggest problem. The lack of heating of the surface is trivial problem compared to the missing heat problem. Without explaining that AGW is not a consistent complete theory that could possibly be ascribed any merit whatsoever other than as a passing idea some people have. I believe that every scientist in the world would have to agree 100% with me on all of what I have stated here and if anyone has a clue how the models or the theory shows where the heat went you can write mr Hansen because he himself has not been able to explain it. He tried to show some of it went into the ocean. He got much less than half the energy accounted through some pretty questionable and error prone measurements. We don’t have to wait 30 years or 1 more year. Until the AGW folks can exaplin where all this heat over the last 16 years that is supposed to be created by all the feedbacks and co2 that we pour into the atmosphere then the theory is as good as dead on arrival. One has to look at the time scales to assess whether the climates temperature is increasing or decreasing. Climate is an average of the observed weather over a period of 30 years. NO! That is plain wrong, and the remainder of your post is based on it so is also wrong. A ‘climate normal period’ has 30 years duration. A climate datum can be provided for any period if the length of the period is stated. A climate datum is compared to a mean of similar data from a 30-year period that has been chosen as a ‘climate normal period’. So, for example, global temperature data are reported as “anomalies” (i.e. differences) from the average global temperature of a 30-year period chosen as the ‘climate normal period’. But the providers of the global temperature data sets (e.g. GHCN, HadCRUT, etc) each use different start and end years for their individual ‘climate normal period’. The 30-year duration of climate normals was decided in 1958 as part of the International Geophysical Year (IGY). This duration was an arbitrary decision based on the general agreement that only 30 years of reliable climate data then existed. The arbitrary 30-year length of climate normals is unfortunate for several reasons. For example, 30 years is not a multiple of the 11-year solar cycle, or the 22-year Hale cycle, or etc.. But a climate datum can be of any duration provided its start and end dates are stated. For example, the global temperature data are stated for individual years. And the 1994 IPCC Report used a series of 4-year periods to compare hurricane frequency. Indeed, the duration of the entire Holocene is often compared to the climates of earlier geological epochs. The importance of the recent 15 year period is what it indicates concerning the validity of climate science as reported by the UN Intergovernmental Panel on Climate Change (IPCC). The 1997 UN IPCC AR4 Report predicted (n.b. predicted not projected) that global temperature would rise over the first two decades after 2000 at an average rate of 0.2deg.C/decade +/-20%. This rise was certain because it was “committed warming” which the climate models said must occur as a result of anthropogenic GHG emissions already in the system. In the graph the orange line represents the “committed” temperature increase the IPCC said would occur after 2000 if there were no additional CO2. Clearly, actual temps from 2000 until now are lower than the projected “committed” warming while CO2 levels have continued to rise. There are only four possible meanings of the flat-line in global temperatures over the last 15 years; i.e. 2. The global temperature estimates are wrong. 3. Natural climate variation is sufficient to overwhelm anthropogenic warming. 4. Some or all of the possibilities 1 to 3. It’s even worse than what you say. Any climate theory I postulate may not be able to predict what the temperature at any time T is. However, if the temperature at time T for a period of substantial duration is different than the predicted value then the theory must explain why. If scientists say, a ball must have uniform motion, then if the ball doesn’t have uniform motion the science must be able to explain why, for instance the ball had resistance from X. If the temperature is not what the models say there should be an explanation. We shouldn’t get blank stares, “JUST BELIEVE US, IT”S COMING.” That’s NOT how science works. If the temperature is not what it is today they must be able to explain why it is deviating, at least qualitatively if not directly. They must be able to say, oh well, that’s possible if the oceans have cyclic patterns A and B. Without being able to explain at least qualitatively the motions and cycles and roughly WHY this is happening that we have 16 years of non-conformance with the CO2 heat that is supposed to be generating massive amounts of additional energy in the atmosphere then they must have a theory what IS GOING ON. If not, then why should we believe ANYTHING they say? That is for religion to say things like “Believe us”. It is for religion to say things like we don’t know why your father was murdered but he went to heaven. It is for science to say well, your father was murdered and here is the bullet and sorry we didn’t see it coming. The models must at least explain qualitatively why there is a 16 year haitus in temperatures. They cannot simply ignore it and say “don’t know what that is about but don’t worry, it will all come together soon.” That’s not science. That’s religion. Scientists should be saying, well it’s likely there is some cyclic thing going on with ocean currents we didn’t know about. Factoring that into our models we see that well, we overestimated the rate of temperature rising in the 1970-1999 period and therefore we may have overestimated the sensitivity of the atmosphere to CO2. A scientist would have to say that at the minimum “The fact that the data has not conformed to the theory for 16 years” reduces the probability our models are correct. It reduces the certainty that we stated earlier. That’s the minimum that can be said as a scientist. As a politician they can say anyhting they want. They can say the case is stronger than ever. However, scientists have to have a higher calling. We have to be able to call a spade a spade and if we run 4 billion experiments looking for a partical we expect to find in 1 billion interactions we can say that the theory hasn’t been disproven but we have to say it is not looking good for the theory. We have to say the probability the theory is correct is declining. So what their saying is the last 16 years are the hottest on record. This does not contradict the fact that there has been no warming for 16 years. Seems the 1930’s got adjusted, just amazing !!! To those that claim that 1934 was the hottest year on record please be aware that the “record” high temperature at the time was only for the US. The global temperature for that year was the 49th on record (as of the end of 2011). re your post addressed to me at October 16, 2012 at 10:00 pm. They didn’t have anything to say about this while the warming trend was accelerating. The appeal to various and vaguely specified natural forcings interfering with the CO2 signal would be more persuasive if any such effects, and their specific causes, had been forecast, and quantified even roughly. They were not. Which puts “paid” to the claim of having examined and ruled out the influence of such forcings in the past. Which renders the “remnant CO2 explanation” null and void. 2 days from the DM article for the Guardian to come up with this? what a surprise? Reports suggesting that global warming stopped 16 years ago are “misleading”, the Met Office said yesterday. so how did the Western Morning News come up with that headline? I read John’s interesting link and by coincidence about three years ago i wrote something similar. I reproduce it below as it helps to put evolving climate into perspective. 1960 9.79 Using advanced modelling techniques. I called the people born in the period from 1660 to 1880 ‘LIA Everyman’ in as much the person lived part or all of their lives during the little ice age. Those born born from 1890 to the present day I have termed ‘UHI Everyman’ for obvious reasons. No adjustments have been made to correct UHI, poor siting, change of instruments etc. The depths of the LIA can be clearly seen, but what I find interesting is that temperatures have risen only some 0.6 degree C since the warmest period of the LIA, which does not suggest a runaway climate change scenario to me. Of course since this piece was written there has been a downrurn in CET so the extrapolations would come down somewhat. it would be interesting if anyone else living in a country with long records-Holland, Denmark, Sweden etc, would care to compile a similar chart on the same basis, that smooths out the short term noise. (2 Pages) 17 Oct: Charleston Daily Mail: Dan Surber: The globe actually hasn’t been warming? Climategate should have ended this nonsense. Unfortunately, the media ignored its implications because most “environmental reporters” are true believers who spread their opinions in articles disguised as news reports. So it goes with global warming. Questioning the science – being skeptical – results in being labeled anti-science.To be sure, carbon dioxide is a greenhouse gas and it can help the Earth trap heat. Sir James Lovelock was the first to signal the global warming alarm back in the 1970s when fears of global cooling were en vogue. Now 92, he is surprised to see that none of his predictions of gloom and doom came true, but he is philosophic about this outcome. “One thing that being a scientist has taught me is that you can never be certain about anything,” Lovelock told the Toronto Sun this summer. The good news is once again, the sins of man will not end the world. The bad news is the charlatans who pushed this stuff will never be punished. no surprise here, MSNBC/Wynne Parry’s climate scientistS (plural) = Michael Mann. 16 Oct: MSNBC: Wynne Parry: Did Global Warming Really Stop in 1997? Michael Mann, a climate scientist at Pennsylvania State University, called the latest story “just more dishonest cherry-picking and sleight of hand by Rose” and his go-to sources. Journalist David Rose argued it showed there has been no appreciable rise in global temperatures for almost 16 years, from early 1997 until August 2012. He added that’s the same length of time global temperatures rose from 1980 to 1996 after being relatively stable, or slightly in decline, for 40 years prior to that. So, does this prove the theory of man-made global warming – that global temperatures rise in lockstep with increasing man-made industrial carbon dioxide emissions – is a hoax? What this shows is how politicized even the release of basic climate data has become. Further, the theory there’s been a pause or hiatus in global warming – which early climate models failed to predict because they weren’t programmed to take into account natural factors affecting climate such as the sun and ocean currents – isn’t new. As I reported in May 2008, for example, German climate scientists with the Leibniz Institute of Marine Sciences theorized at that time in a paper published in the prestigious scientific journal Nature that global warming had temporarily stopped due to the influence of ocean currents. They predicted global temperatures would not start rising again until at least 2015, when the underlying man-made warming would re-appear. Problem is, there are huge policy implications for the public right now if it turns out natural factors are having a greater influence on climate than previously believed. This would call into question the value of government carbon pricing schemes such as cap-and-trade and carbon taxes, as well as the massive public subsidization of green energy. Particularly since to date, none of them has significantly lowered greenhouse gas emissions, much less cooled the planet. Here’s the Twitter flow around a special session I’ve been running this morning at the United Nations, called Conceptualizing a Set of Sustainable Development Goals:.. COMMENT: Mike Mangan: I’m opposed to anything built on a sentence that contains both “conceptualize” and “sustainability.” It just begs parody and mockery. Sorry. COMMENTS: Revkin: Despite the many deep flaws, I see the United Nations as a vital enterprise. Looking out at representatives of Latvia sitting elbow to elbow with those from Laos, as I got to do today, you get an extraordinary view of an incredibly challenging effort to build a constructive global conversation. A world without it would be worse off. Just my view. And so it begins. Past time, too. OK, what does a sine wave have to do with the effect of greenhouse gases? Clue: Nothing. You are using math which does not apply to the real world in the way you would wish. So many strong opinions from people who don’t know their laws of thermodynamics from a hole in the ground. Why is it that Rose has chosen denigrate the work of the scientists involved in ‘climategate’, and at the same time is relying solely on their data in an attempt invalidate..what, radiative physics? There are other sets of data around.